My first #bondatewithK this 2016 happened at Osaka Ohsho in Eastpoint Mall. This gyoza specialist established in 1969 deserves its title. 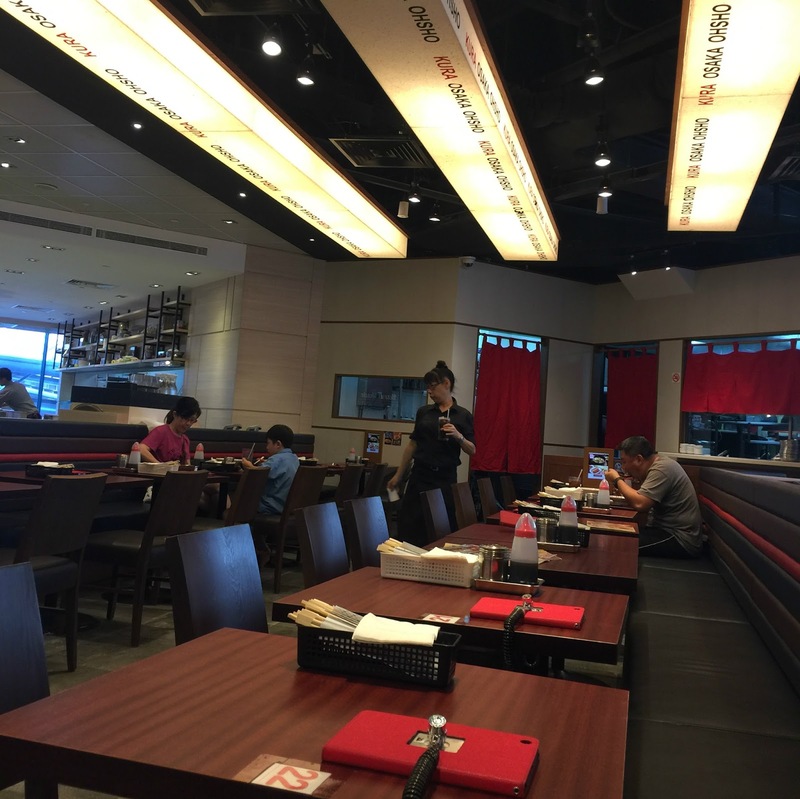 Osaka Ohsho literally translates into "The King of Gyoza in Osaka". I will talk about their signature handmade gyoza in a bit. Above is the photo of their food offerings which includes Japanese-Chinese favourites. Osaka Osho offers casual dining experience and they are one of those restaurants whose ordering system is via the screens provided on each table. The service is swift, probably because we were one of the firsts who came for dinner. The restaurant looks very quiet when we arrived around 6:30pm but by the time we finished our meal, diners started swarming. Sometimes, I do judge (wrongly) the restaurant by the number of diners I see in the establishment while I was there. Just that it was one of those days I like going to quiet places to have a peaceful meal. Glad we still went in despite of no crowd. K had Chicken Curry Rice (one of her all-time-favourites) which as expected was quite a big serving. It came with a generous amount of french fries. I predicted she's gonna pass me over half of her food so I only ordered their signature gyoza. WORTH. RAVING. ABOUT. One of the best gyoza's I have ever tasted. Crispy on the outside, juicy and tasty once you sink your teeth into it. In between savouring our food, K and I loves catching up with each other's what-abouts. I have nothing much to share because my work life is relatively boring but I always enjoy hearing K's stories about school, her friends and other girly things. Here's a photo of us for posterity. Please excuse my no make up look, I seldom put on make up these days. PS. I hashtag this #bitesizefoodreview for a reason. We don't usually order a lot of food because there is still another round of homecooked dinner waiting for us at home. Our main agenda is to bond over food (that's why I also hashtag it #bondatewithK) which we can't do at home because I have a clingy boyfriend (a.k.a. my toddler). Also, do note that I am not a food blogger. I just love to document our family memories.